Whitesnake's UK tour starts at Manchester Apollo on 27 May. For full dates - www.getlive.co.uk / 0870 400 0688. How has the recent tour gone down with fans (the one from which the DVD was taken)? Whitesnake have always been a top live draw. Why has it taken so long for a Live DVD? The DVD shows the band in fine form, are you pleased with it? The setlist is pretty varied. How did you decide which songs to play? Do you got the balance about right? How involved were you with the project and final compilation? What are your next projects, solo and for Whitesnake? 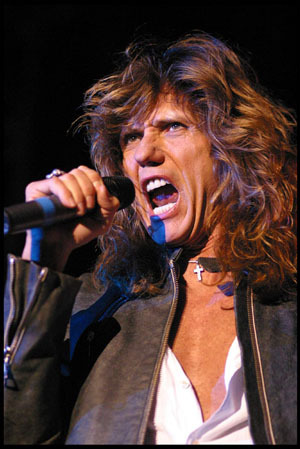 When you record solo, or even with the Coverdale/Page project, do you feel the Whitesnake tag is unfairly applied? What did you make of the recent DVD issue of California Jam? I bought it...along with everyone else!...I've only watched it a little...Man...30 years ago! If you believe the reports, Ritchie Blackmore is prepared to play a one off gig with a reformed Deep Purple. Would you be interested too? There's been an increasing number of compilations in the USA and UK, while the individual albums have been largely passed over. Do you think there's a case for a proper reissue campaign with each album done fully and properly? Cozy Powell once told me Whitesnake was the only band he didn't audition for. True? And y ou once co-wrote an instrumental song with him. How did that come about? And message for your fans? I can't wait �til I'm back onstage playing for you! How is the latest tour going? Proving as popular as ever? Last time I saw Whitesnake you had a pretty diverse audience, all ages enthusiastic. Is this still the case? Yes...and we have now added a much younger element to the already diverse mix of ages...and they are very welcome!